When tourists and visitors make their way to Witless Bay, it’s important for them to be able to get an idea of what they can do here so that they stay a while and take advantage of all that our Town has to offer. One key way of doing this is to offer them a “top 10” list of things to do here! The Community Enhancement Committee has been working on a community mapping project these past months, to replace the map that’s currently on our Town brochures. 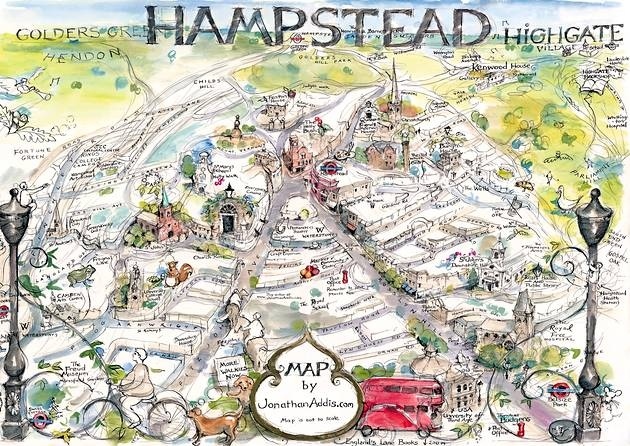 We are also aiming to produce a larger print of this community map for the visitor centres and to offer as keepsakes. (click HERE for a great example). • The Enclave: Focussed on nature. Beautiful. Professional aesthetic. Inspiring. • Sussex University: Beautiful. Professional. Clean. A little too busy to allow for text. • Freshwater Bay: Playful and colourful, but a little too amateurish and way too busy. • Hampstead Highgate: Nice aesthetic, good flow. A little too busy. Not enough colour. • Amsterdam: Superb. Not enough space left to highlight attractions, though. We are currently at the “design” phase, and are working to bring all of the various elements needed together. One of these is a collection of short stories. Do you know a good ghost story taking place in Witless Bay? Or a story about the fairies? How about a story about one of the ships that sank in our harbour? Or a tall tale, a legend, a strange rumour? How about a story that’s just too good to be true? Email me (sebastiend @ mun.ca) with ideas!